In an otherwise grim day for rookie quarterbacks, Robert Griffin III’s debut against the New Orleans Saints went about as well as it could possibly go. He went 19-for-26, threw for 320 yards with two touchdowns, and, most importantly, led the Redskins to a 40-32 Week 1 win. Following the win, many were quick to applaud the Redskins’ approach, which seemed to allow Griffin to get comfortable with quick, easy throws. But the real hero of Washington’s offensive success wasn’t Kyle or Mike Shanahan. In fact, he isn’t even on the staff. 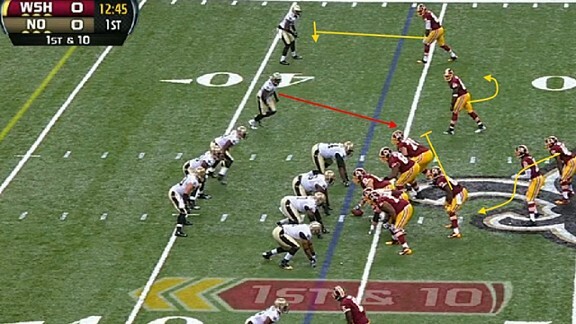 It was Art Briles, Griffin’s college coach at Baylor, and, based on what the Redskins showed in Week 1, the team’s de facto co–game planner along with Washington’s head coach. Coaching is about putting players in positions to succeed. Griffin’s potential is nearly limitless, but as a rookie playing his first game, he’s not Tom Brady just yet, and asking him to throw 40 or 50 traditional drop-back passes was not going to give Washington its best chance to win. Shanahan has clearly gone into this year with an open mind — something many otherwise excellent pro coaches don’t do often enough — and he’s blended his tried-and-true West Coast/zone-blocking offense with some of the best and simplest principles Griffin executed so well at Baylor. I asked Shanahan if this had been by design — if he’d set up that first drive with those quick passes to help his rookie get into the rhythm of the game without facing pressure from the Saints’ defense or pressure to go through progressions while he got his feet under him. Because I figured, if it had been, it was a pretty smart idea. This idea, known in coaching circles as “packaging plays,” is the newest and most effective development in football. By blending passes and screens with running plays, the quarterback can decide who gets the ball based on what the defense does, and in turn, turn the defense’s own decision into its own fatal mistake. It’s a credit to Griffin that although he may not be ready to be Tom Brady on a drop-back pass, his coaches trusted him to be the point guard of his offense. It’s triple-option football, translated and transmuted into something palatable for the pros, and it worked. The credit goes to Shanahan for evolving with the times and embracing a style his young quarterback is comfortable with. Let’s look at an example from early in the game to illustrate. On first-and-10 in the first quarter, the Redskins lined up in one of the sets they used the most: three wide receivers, a tight end/H-back (Fred Davis) who’s able to motion to either side, and a single running back next to Griffin, who’s in the shotgun. The call is a simple inside-zone run, where the line used zone blocking to attack the defenders in front of them while Davis crossed the formation to seal off the edge. The receivers, meanwhile, ran an entirely different play — a quick screen to the slot receiver, Pierre Garcon, with the outside receiver blocking for him. It was Griffin’s job to determine who would get the ball. The Saints stacked the box not only with four defensive linemen and three linebackers, but also safety Roman Harper, who came down on a blitz from the outside. 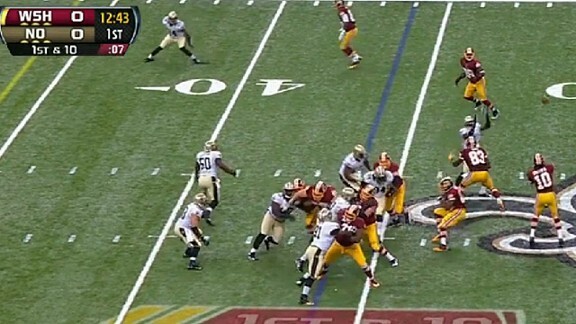 This became an obvious read for Griffin, as Garcon was wide open with nothing but green grass in front of him. Griffin simply pulled the ball from the running back and flipped it to Garcon, who caught it and did an excellent job taking the yards that were there. 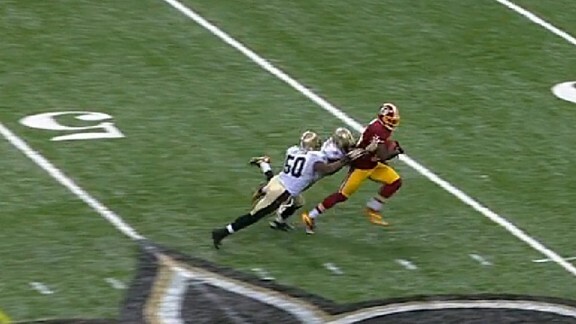 Garcon was tackled after a nine-yard gain — pretty good for a “run” play. 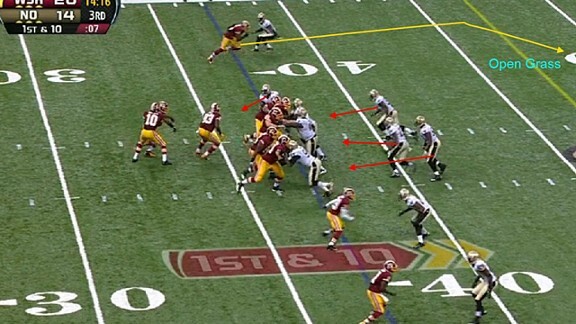 The reason these plays work is that all the blitzing and guessing from the Saints defense can be used against them. These sorts of plays — screens built into run plays with additional reads — discipline defenses. If they guess and get out of position, Griffin either keeps the ball or flips it to a receiver for easy yards. Once they play honest, that’s when the downhill running game opens up. 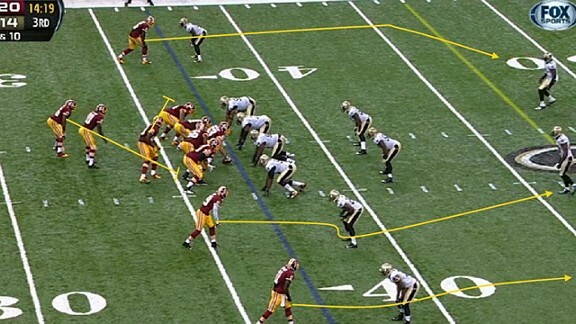 Against the Saints, the biggest beneficiaries of these plays were Griffin and his receivers; in future weeks it will be Washington’s running backs, who will have fewer defenders to deal with in Shanahan’s patented zone-blocking schemes. Shanahan emphasized this during his press conference, in response to a question about the early quick passes: “We really don’t know what’s going to happen until the defense plays, so we had running plays called and all of a sudden they gave us certain looks to take the running game away, and we threw a couple of bubbles early … And it’s pretty impressive when a young guy comes in and plays with that composure especially in an environment like this.” He noted that they were “not audibles” but instead were decisions Griffin made at the line of scrimmage. This is stuff straight out of the playbook Griffin and Briles used at Baylor. 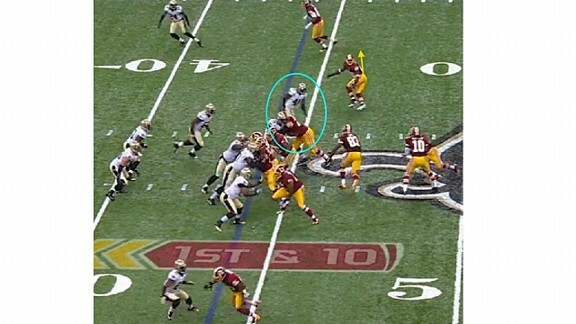 As the game went on, the Saints tried to take away both the inside runs and the quick receiver screens. This meant covering up each receiver while still stacking the box, and pretty much daring the Redskins to throw the ball downfield. Shanahan and Griffin’s response to this was also straight out of the Baylor playbook — play-action passes off zone-read action. These concepts are really Spread Offense 101 ideas. Usually, the knock on the spread offense is that it ends up a horizontal game of dink-and-dunk, but this wasn’t the case with Griffin’s offense at Baylor. The Bears’ attack last year was the most vertically explosive spread offense I’ve ever seen. 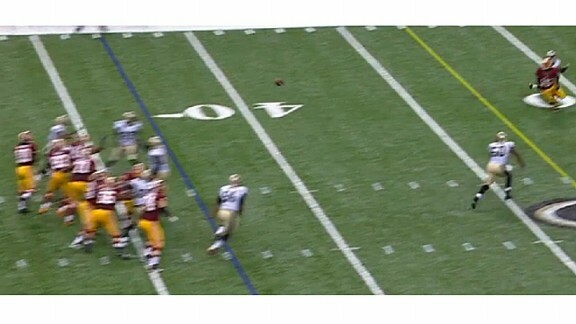 This was primarily because of Griffin’s deadliness with play-action passes, something Shanahan has clearly embraced. A perfect example came early in the second half. Using the same formation he used for the zone-read/screen concepts, Shanahan called a simple play-action pass where the slot receiver ran a seam route while the single outside receiver, Josh Morgan, ran a skinny post. Griffin’s job was to fake the zone-read handoff and eye the safety. If the defender took the post, he’d look for the seam; if the safety took the seam, he’d look for the post. As Davis crossed the formation to block, the line fired out as if it were blocking for a run, and Griffin and the running back “meshed” the handoff just as they would on a zone read. The entire Saints defense reacted swiftly, determined to snuff out the run play. 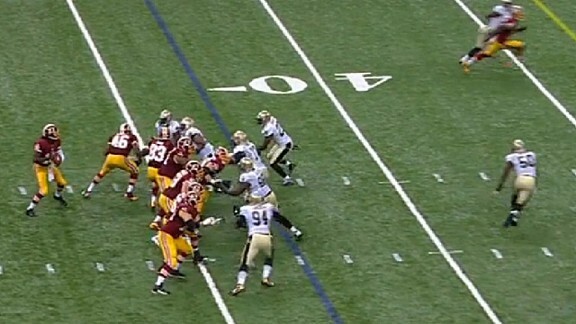 The Saints defense crowded around the line of scrimmage, opening up space for Griffin to throw downfield. As the deep safety rolled toward the slot receiver — Griffin had hit the seam route just a few plays before — Morgan was one-on-one with his defender and had plenty of room. Griffin does an excellent job of resetting his feet after faking the handoff, and Morgan’s clean release gives his quarterback a big target. At that point, it was just pitch-and-catch as Morgan and Griffin connected on a 21-yard gain. Aided by a pass-interference penalty, the Redskins would score another touchdown on this drive and further their control of a game against an opponent they seemed to have little trouble with all day. It won’t all come so easily to Griffin, but it would be difficult to imagine a better start. New Orleans’s defense won’t be confused with the old (or even current) Steel Curtain anytime soon, and other teams will have better and more disciplined plans against these packaged plays. To be truly elite, Griffin will have to succeed by the standard of every great NFL quarterback: contested, do-or-die drop-back passes against defenses that aren’t simply worried about runs and screens. Griffin’s advantage is that he adds an element to Shanahan’s pro-style offense that can’t be understated. It cannot be emphasized enough that all those supposedly “easy” passes Griffin threw early on were decisions he had to make based on how the defense played. That may be the most exciting thing about his debut. Unlike many NFL coaches whose egos and lack of creativity won’t allow them to utilize their players’ strengths and weaknesses, Shanahan is evolving his offense into a reflection of his young quarterback. Robert Griffin III is not a “running quarterback,” but rather a quarterback who can also run; Shanahan’s Redskins offense is not a college-style spread offense, but a blend of a pro-style system that also incorporates some of college football’s newest and best ideas. Griffin certainly has a long way to go, but his development — and the development of this offense — will be fun to watch, unless, that is, you’re the one trying to stop it.